Spatial awareness: both physical space and musical space. Spatial and Movement Qualities: above and below, over and under, side to side, up and down, closed and open, curvy and straight, forward and backward, right and left, near and far, center and periphery, around and through, away and toward, beginning and end, front and back, jagged and smooth, heavy and light, thick and thin, opposites, contrary motion, crossing the midline, etc. Basic shapes with the body: lines, circles, squares, triangles, rectangles, ovals, etc. Various types of locomotor skills: movement across the floor on one's feet, back, stomach, side, knees, hands and knees (crawling), hands and feet (bear walk, crab walk), etc. Rolling, crawling, sliding, creeping, growing, collapsing, sneaking, walking, marching, trotting, jogging, gliding, running, tip-toe walking/running, stomping, lunging, leaping, jumping, hopping, galloping, chassé, skipping, swinging, swaying, spinning, turning, shaking, wiggling, etc. All of the appropriate musical and emotional connotations from moving in these different ways. Musical use of materials: hoops, bean bags, ropes, scarves, ribbons, batons, balloons, balls of various sizes (kicking, tossing, bouncing, rolling), etc. Musical use of different instruments: claves, drums, maracas, xylophones, etc. 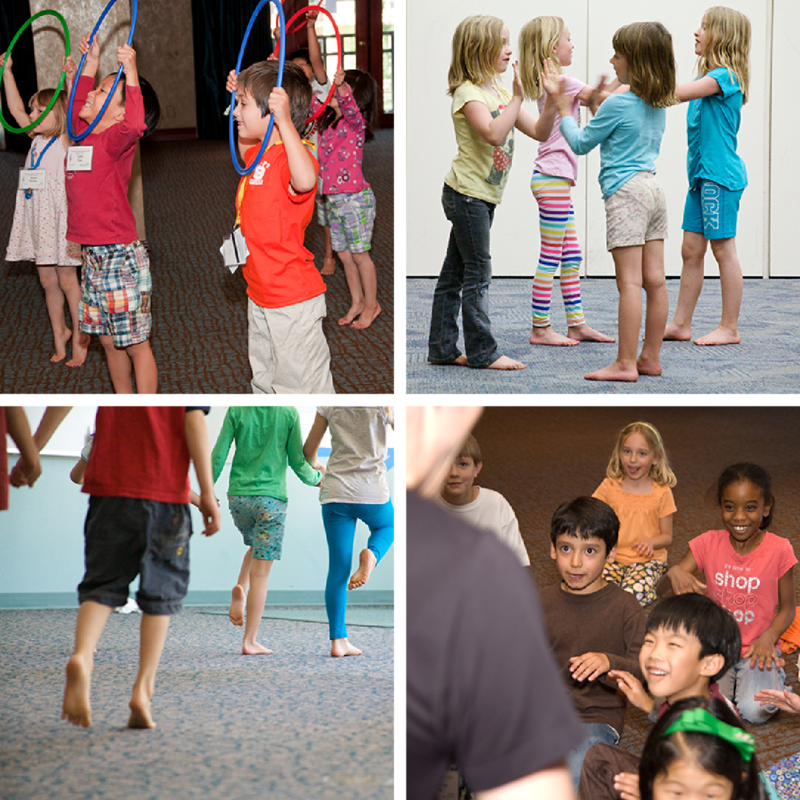 Moving, dancing, clapping, sharing, improvising, singing with a partner or small group. Exact mirroring of gestures provided by the teacher or other students in the class. Solo work: working or performing solo develops confidence, assurance, and independence. Imagination: gestures, images, story-telling, and programmatic music (music that tells a story) helps to encourage, stimulate, and develop the child's imagination. Pitch matching and identification: developing the ear for accurate intonation and healthy singing. Students will learn to sing and identify scale degrees 1-5 in major and play them on a xylophone. Basic echo canons and folk songs. Corporal embodiment of pitches in physical space. Identification of major and minor tonal landscapes. Rhythmic, metric, and expression knowledge: moving, listening, singing, analyzing, writing, improvising, and deep understanding of the following musical concepts in both literal and symbolic notation.